Who’s ready for the future? Sometimes you read a friend’s posting on facebook and you think that’s brilliant, more people need to see this. I ask because it’s already here, it’s happening right now. So what are you doing about it? Because you are right at the forefront of change, yes you, you can do anything that your heart desires, oh yes you can, because you are the change, you are a happening, you will do well to always remember that you are also an explorer, yes you, and that you are on the edge of something new every single second of your life. You are the change. Do you need me to prove this to you? OK, go and stand outside and put your arms up to the sky, guess what? You are touching new parts of this Universe that have never ever been touched before, yes you, you are seeing new parts of the Universe that have never been seen before by the naked eye, you are forever moving forward, breaking new ground, you are touching change, feeling it at every moment as it sails through you, you are the change, some might say that you are the original space cadet 😉 yes you, because you are exploring and going further than any human being has ever gone before, yes I’m still talking to you, you are going to infinity and beyond, and nothing can stop you, because you are the change…..
We are all standing on the edge of an explosion, flying through space at speeds that we can only dream about, have a look all around you, it’s beautiful isn’t it? And you and I are right at the front of it, take a good look, be inspired by the change that you see all around you and inside of you, it’s the one thing that is constant, change is a happening that lasts forever, and you and I are at the very front of it, we are the change, so accept it, be a wonderful part of it, help to push it through in your own unique way, be a part of the change. If we stand together shoulder to shoulder and use our hearts then the change will be unstoppable – and beautiful. Because together we are strong. Together we are beautiful. Together with our hearts we are unstoppable. Now if that doesn’t make you realise how important you are, if that doesn’t wake you up as to how incredible we all are, if that doesn’t inspire you to open your heart and be a part of the change that’s needed, then you need to keep looking into the sky until it does. We can change because we are the change, we can create the world that most of us dream about because we are just as important as any other living creature, we are all equal on this planet no matter what anyone says, so we are all equal in this change, don’t ever let anyone tell you anything different, we are all at the forefront of change, every single one of us, no one is above you or below you, we are all exploring this Universe at exactly the same time, therefore we are all important – equally, and every single one of us has a right to a say on how we get by, on how we keep going on this journey that just keeps on stretching the boundaries of time and space.. So be a part of it, get involved, get active, this is our world, all of us are a part of it, and right now we need as many good people as we can find to come together and stand tall, we need open hearts from every part of this wonderful spinning planet that we share to come together, every outstretched arms touching and feeling new space as we fly through this Universe needs to come together, we cannot continue to leave it to the few who rule over us, they are making a mess of this planet and its inhabitants, and they constantly tell us all that we can’t do anything about it, well I think we can, I think that good people coming together can do a much better job, but it will take every single one of us to stand up and join in, and when they tell you that you can’t change the world alone then remind them that you’re not alone, there a millions of us who feel the same way as you, remind them that we are the change, and together with good hearts we are strong, and we will change things for the better. Now get active, be a part of it all, be the change because you are the change, yes you…. Yes, Ian Roberts, I stand with you. 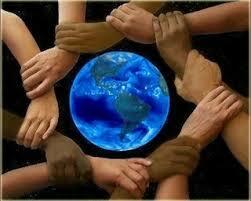 I agree that together we can link our arms and be the change that we need. Thanks for your wonderful comment Rosaliene, together we can do so much!